Hewson, Leprine return to Mules' lineup in second half of season and make big impacts. WATERVILLE — Two games into the NCAA Division III tournament and Colby College center Nick O’Connor’s name has hardly been mentioned. For the junior from Canton, Massachusetts, that’s exactly how he prefers it. O’Connor, though, is not overlooked when it comes to on-ice contributions for the Mules, who are headed to the program’s first Frozen Four appearance this week in Lake Placid, New York. Fourth on the team in scoring with 11 goals and 24 points, O’Connor’s input comes in myriad other forms. He’s Colby’s go-to man on defensive zone faceoffs, one of its best penalty killers and capable of handling either checking duties or offensive production. Think of O’Connor as Colby’s version of the Boston Bruins’ Patrice Bergeron. He’s never going to wow you with a stat line that jumps off the page, but his presence is noticeable. 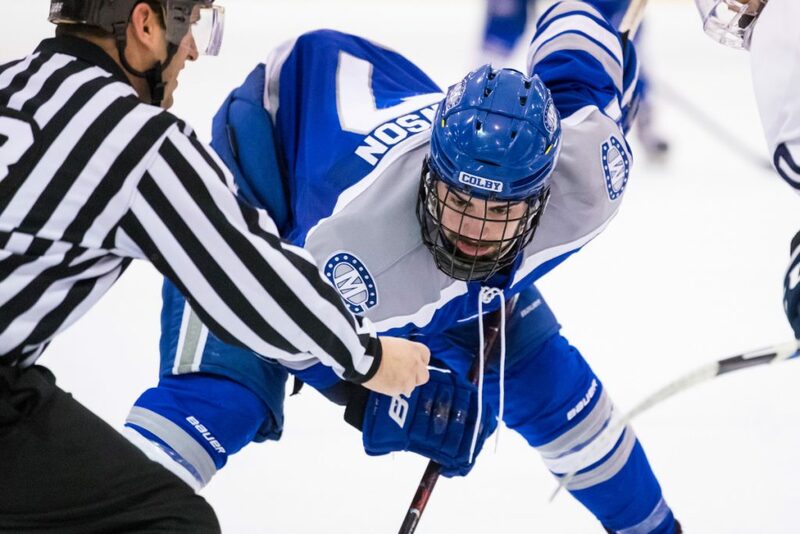 Impacting so many different areas of the game through all three zones, it’s a wonder the 5-10, 183-pounder isn’t playing hockey at the Division I level. It’s a feeling MacDonald has expressed in the past. “Once again, I was an under the radar type of guy,” O’Connor said of the lack of Division I interest when he came out of prep school. “I just wanted to come to a good school, and the NESCAC was definitely a priority of mine. Freshman Spencer Hewson has ridden the typical ups and downs of a rookie season in college hockey, but the 22-year-old from British Columbia had enough prior hockey experience to find his way out of a midseason slump. To nobody’s surprise, Hewson is third on the team with 15 assists, one of only two freshmen with more than five points this season. Hewson was a healthy scratch for consecutive mid-January games against Wesleyan and the University of New England. He returned to the lineup and hasn’t missed a game since, playing his best hockey at the time when Colby has been rolling. One of the areas Hewson said he wanted to work on most was faceoffs. The extra focus paid off, as Hewson has joined O’Connor as the Mules most trusted men in the dot during key situations late in playoff games — especially in the defensive zone. Sophomore defenseman Mark Leprine’s season got off to the worst imaginable start. Not only did he suffer a concussion during the offseason, but he also battled mononucleosis while trying to find his way through significant post-concussion syndrome. Coming off a promising rookie campaign, Leprine didn’t find his first game action until Jan. 5 this season. He played in the next three Colby games, but found himself back watching from the stands for six of the team’s next seven. Coincidentally or not, Leprine has played in all nine games during the team’s 7-0-2 run that included the NESCAC championship and two NCAA tournament game wins. Leprine has paired mostly with senior Dan Dupont since returning to a regular shift. While Colby is making its first trip to the Frozen Four in Lake Placid this week, for one Mule it’s not a first appearance in the Frozen Four or at Herb Brooks Arena. Senior goalie Sean Lawrence was a backup for Quinnipiac in the Division I Frozen Four in 2016. The Bobcats lost to North Dakota in the national championship. While also at Quinnipiac, Lawrence made two trips to Lake Placid for the ECAC Final Four. During his freshman season, he saw five minutes of action in a semifinal against Harvard.